Congressman Earl Blumenauer (D-Ore.) was the first elected official when he (rightly) called for the removal of DEA Chief Chuck Rosenberg on the House floor, but he certainly wasn’t the last. 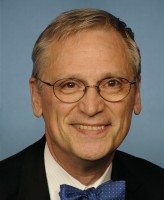 True to his history, Rep. Blumenauer not only has demonstrated great leadership, but also the ability to garner bipartisan support for sensible reform as Congressman Dana Rohrabacher, a Republican representing Orange County, California, signed onto a letter calling for the removal of the head of the DEA. “Rosenberg is clearly not the right fit for the DEA in this administration,” Blumenauer said during a speech on the House floor Wednesday morning. A groundswell of support for the firing of Chuck Rosenberg has been generated through the efforts of Marijuana Majority, whose petition calling for his removal has earned more than 100,000 signatures delivered to the DEA’s headquarters today. Representative Blumenauer and his colleagues are adding tremendous momentum for the effort to dismiss Rosenberg and to the notion that there should be consequences for government officials, especially those engaged in drug policy, that demonstrate sheer ignorance regarding cannabis. Rosenberg became the acting administrator of the DEA just six months ago, after public and Congressional outcry over a series of scandals under the leadership of then-Administrator Michele Leonhart. Marijuana advocates had hoped that Rosenberg’s appointment would signal a change in tone at the DEA, particularly on marijuana issues. Instead, Rosenberg’s tenure has become notable for how quickly advocates and lawmakers have soured on his leadership. Earlier this summer Rosenberg remarked that marijuana was “probably not” as dangerous as heroin. Given that there’s overwhelming agreement among researchers, lawmakers and the public that marijuana is not, in fact, as dangerous as harder drugs, the statement provoked ridicule and prompted Rosenberg to say definitively a few days later that heroin is indeed more dangerous than pot. I have stated so many times how proud I am of Congressman Blumenauer and how thankful I am that I get to cast my vote for such a tremendous public servant. He has the right position on cannabis and he is very practical and knowledgeable about how politics work and effective ways to increase support for his positions. We wouldn’t be where we are in Oregon, in Congress or in the national debate without the work of Congressman Blumenauer. I don’t necessarily agree with my representative on every single issue, but I know that I can count on him to do his homework and vote his conscious; it helps that his conscious is on the right side of history on the major civil rights and social justice issues of the day. Here’s hoping that President Obama will continue his moves toward sensible drug policy reform and adhere to his promise to place science over politics.